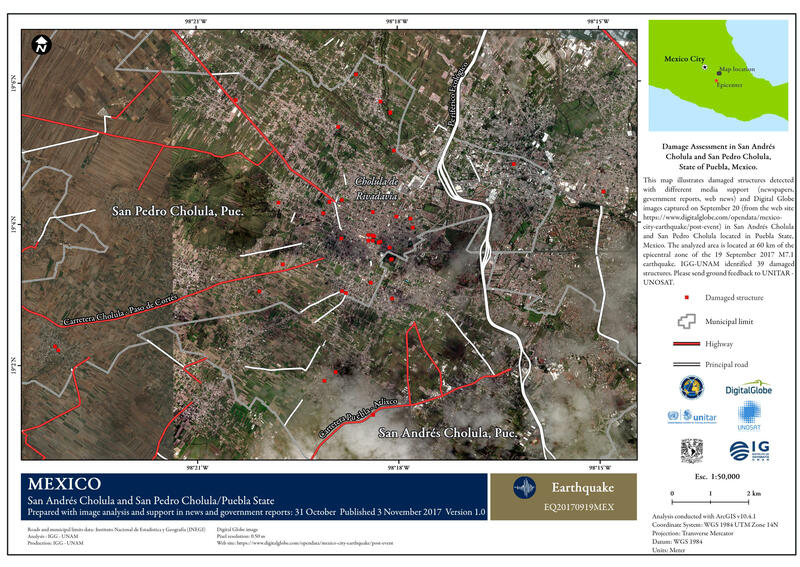 This map illustrates damaged structures detected with different media support (newspapers, government reports, web news) and Digital Globe images captured on September 20 (from the web site https://www.digitalglobe.com/opendata/mexico-city-earthquake/post-event) in San Andrés Cholula and San Pedro Cholula located in Puebla State, Mexico. The analyzed area is located at 60 km of the epicentral zone of the 19 September 2017 M7.1 earthquake. IGG-UNAM identified 39 damaged structures. Please send ground feedback to UNITAR-UNOSAT.